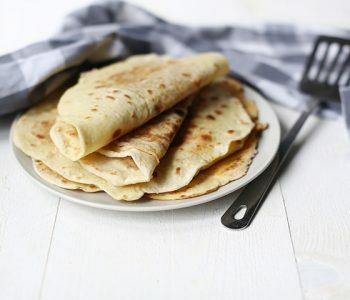 How to make roti you will love. 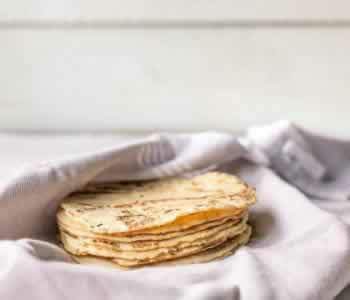 This authentic Indian flatbread roti recipe is made with dahl filling and truly delicious. This roti recipe is very common in the Surinam and Indian kitchen as this dish is originally from India. 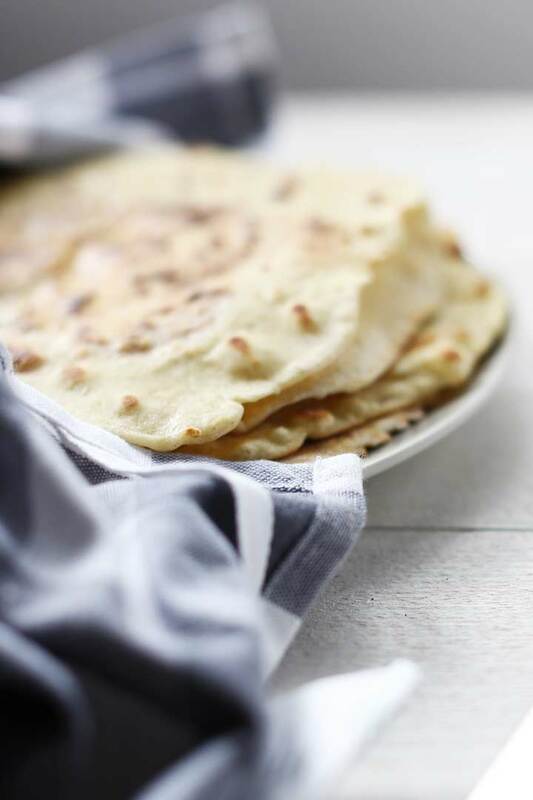 Today I show you how to make roti with dahl filling. Lets get started! How a scent can bring you back almost like time travel. I can see it all in front of me again without having to even close my eyes. It is just like I’m there again. The same applies to the dish we are making today. I don’t know about you but when it comes to food for the longest time my eyes were always bigger than my stomach. Seriously over estimating the amount of food I could eat. We had a rule at home that we always finish our plate and to this day I find it hard to leave food on the table. This one time we were at a birthday party of my aunt. In Surinam culture it is common that when you go visit on a birthday you eat a meal and this time was no exception. My aunt and three or four other ladies were working hard in the kitchen to make sure everybody got to eat. Can you imagine on a birthday cooking for like 40 to 50 people? She was making roti with all the bells and whistles. So the roti base, potatoes, chicken or beef, egg and kouseband, which is like a long green been cut into very small piece. For all the children they would cook kids size roti but I thought I would have no problem eating a grown up portion. So my aunt made me one. I think I sat there for more than an hour trying to eat it all. My father a little annoyed that my eyes were bigger than my stomach said nothing but the expression on his face said enough. I chewed and chewed and finally I managed to finish my plate or that is what I can remember. It would not surprise me if in the end my aunt took away my plate saying something like, enough is enough child. Well the scent of cumin and dahl, that is so characteristic for soft roti that it takes me back to that birthday every now and again. If you do not have self raising flour you can use flour and add baking powder and baking soda to make your own self-raising flour. Making roti is not difficult but has a number of steps. 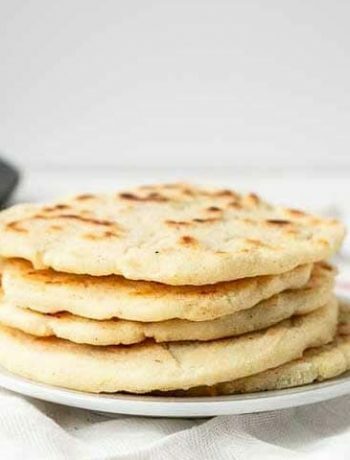 Today we are making roti with dahl filling but you can also make roti with potato filling or without any filling and then it is just a regular tortilla again. 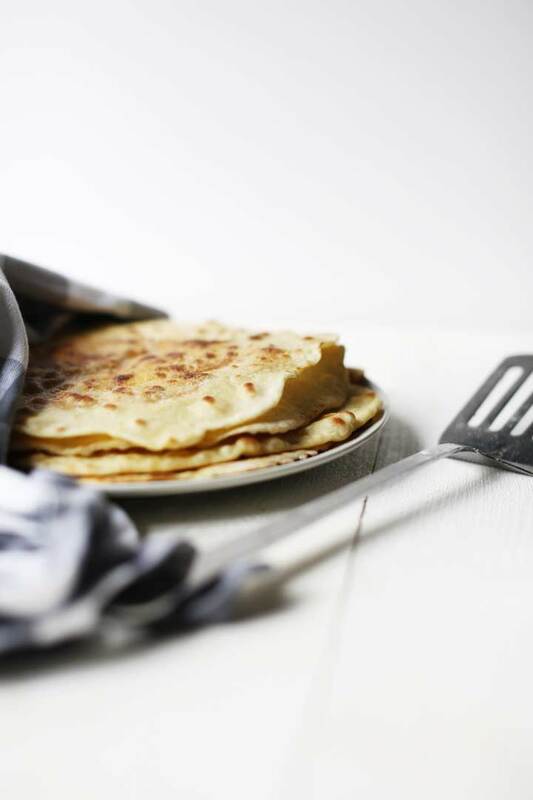 The base of roti recipe is self raising flour or flour with baking soda and baking powder added separately. Further you need water and salt. 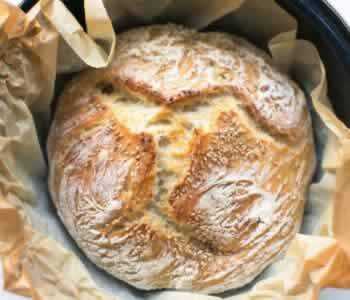 You need to create a dough from the self-raising flour, salt, baking powder and water. Stir the mixture by hand and knead it into a consistent and elastic dough with your hands. This will take a couple of minutes. If the dough is dry add a tablespoon of water and knead. If the dough is to wet add a tablespoon of flour and knead. Repeat if necessary. When you have a cohesive dough put it in an oiled bowl and brush oil on the dough as well. Cover the bowl with cling film or a kitchen towel and let it rest for 1 hour so the gluten in the dough can do their work. Dahl filling is made of yellow split peas that needs to be cooked until soft. I opted for the yellow split pea flour. Put the flour in a bowl and add hot water. Stir the mixture and you get the same result as cooking the yellow split peas but goes a little faster. Add the garlic, pepper, shallot in a mortar and pound until you have a soft paste. Now it is time to add the cumin and pound so more. Set aside. Cook the pepper mixture shortly in some oil and add the dahl. Combine the Dahl and pepper mixture and keep stirring until almost all the moisture has evaporated (do not make it to dry). Shape the dahl into small balls. Take the dough and knead thoroughly. Then divide the dough into 4 to 5 balls the size of a large golfball. Take a roti ball and add the dahl filling in the middle of the dough ball. Close the dough around the dahl ball, press flat and then roll into a roti on a dusted counter top with a rolling pin. 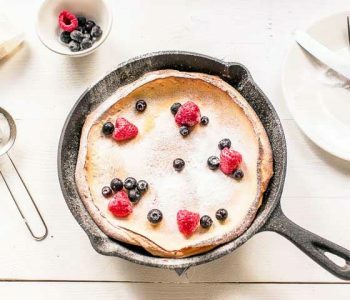 Heat a large skillet and bake the roti without oil first. Wait for the roti to puff up then start brushing the roti with oil and turn. Brush the back of the roti with oil as well. The oil will keep the roti soft. Flip regularly and keep them warm underneath a fresh kitchen towel. These are so good you can eat them all by them selves. Just try you will see I am right. 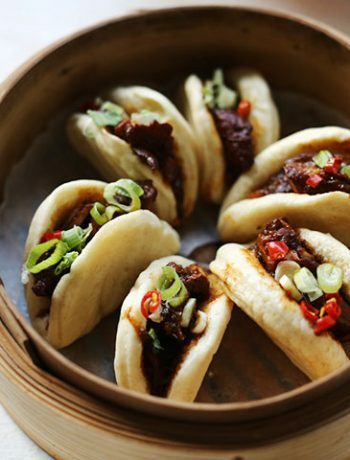 Eat it with some chicken like with the my fathers rustic roti recipe. This soft savory roti freeze really well. So you can make a batch, fold them and store them in your freezer for future use. You can also keep them in a zip loc bag for about a day or two in the fridge. When you want to use them sprinkle some water on them and warm them in a skillet for 30 seconds, flip and warm the other side. You can also heat your oven at 400℉/200℃ and wrap the roti in aluminum foil. Warm for 6-8 minutes and you are ready to eat. I hope you enjoy this how to make roti recipe! Made a recipe Tag @thetortillachannel on Instagram or PIN to Pinterest. We are making a dish that is very common in the Surinam. 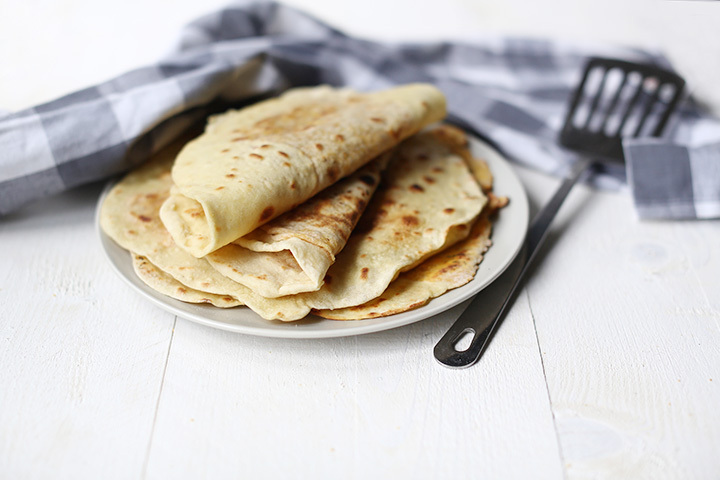 Today I show you how to make soft savory roti with Dahl filling. Lets get started! Combine the self-raising flour, salt, baking powder and water. Add the clove of garlic, pepper, shallot in a mortar and pestle. Grind until a soft paste starts to form. Brush the back side with oil as well. Turn regularly until light brown patches appear and then you are done. Make certain there is enough moisture in the dahl. Else the center of the roti will become very hard. In the recipe instructions you wrote “7. Add the Kurkuma and stir again”. Please what is that? Also, I only found yellow split peas but I’m confused about how to use it since directions are only for the yellow split pea flour. Kurkuma is a yellow spice made from the roots of the Curcuma plant. They grind into powder and you can add e.g. into the Dahl filling. If you can’t find it that is ok. There is only a very small amount of it in the roti. 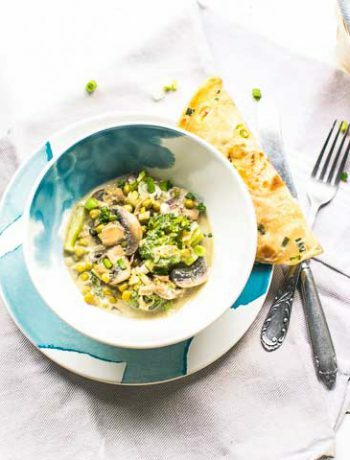 Yellow split peas can indeed be used for this recipe. You need to cook the yellow split peas until soft and you are able to mash it into a puree. It will look like the dahl flour. It can take between half an hour to 45 minutes for the split peas to go soft. After you mash the split peas you can continue the recipe. your recipes are awesome I like all recipe and try at home. Banazer, thank you so much! So great to read you like my recipes. Have a great day.